Digital version of a D.Min. 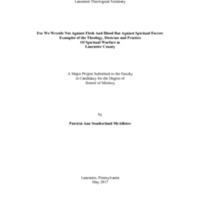 major project by Louis E. Kuykendall, Jr. 183 pages. 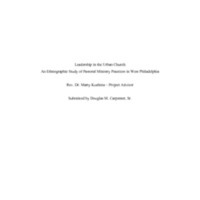 Digitized copy of a D.Min major project by Ruth E. Shaver. 229 pages. Digitized copy of a D.Min. 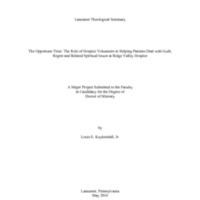 major project by Douglas M. Carpenter. 97 pages. 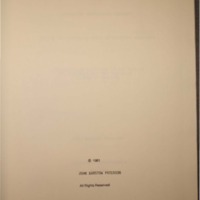 Digitized copy of a D.Min. 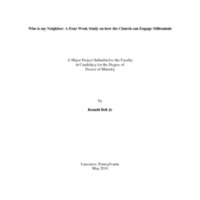 major project by Ronald Bell, Jr. 98 pages. Digitized copy of D.Min. major project by Patricia Ann Southerland McAllister. 97 pages. 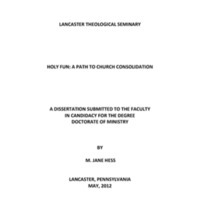 DMin dissertation by Delia M. Fahnestock, May 2008. 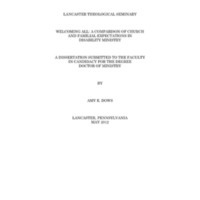 Electronic PDF document. 121 pages. 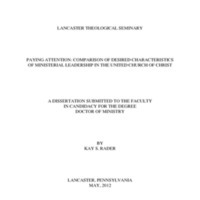 A dissertation submitted to the Faculty in candidacy for the degree of Doctor of Ministry. Anabel Proffitt, advisor. 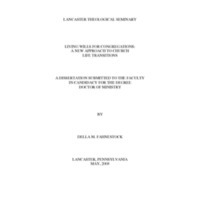 Electronic PDF document. 138 pages. 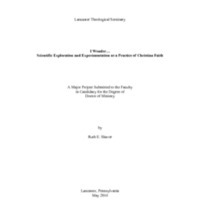 This Digital Archive is maintained by the Schaff Library of Lancaster Theological Seminary. Please contact the Seminary Librarian with any questions.